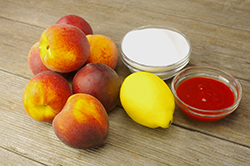 When peaches are in season, I have a hard time holding back and end up buying vast quantities of them. It’s always far more than I can eat before they soften precariously and so I’m always devising new ways to put them into jars. 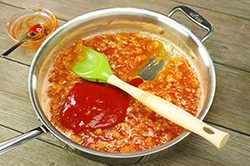 A few years back, while cooking up a little batch of peach jam, my eyes fell on the bottle of sriracha sitting on the counter. On a whim, I squirted some into the nearly finished jam, just to see what would happen. 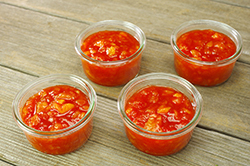 The result was a sweet, tart, and slightly spicy jam that is a revelation with turkey burgers and roasted sweet potatoes. 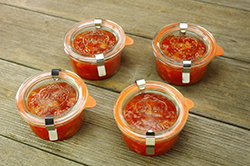 Prepare a boiling water bath and 3 half-pint/250 ml jars according to the process [see below]. 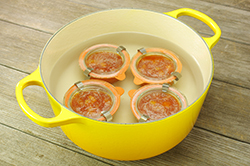 Place 3 lids in a small saucepan of water and bring to a gentle simmer. Bring a large pot of water to a boil. 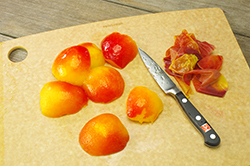 While it heats, cut the peaches in half and remove the pits. Fill a large bowl two-thirds of the way up with cold water. 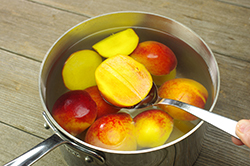 Blanch the peaches in the boiling water for 1 to 2 minutes, then immediately transfer to the ice water. 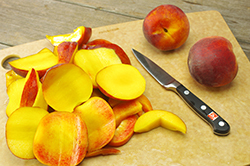 Once they are cool enough to touch, slip off the skins and halve and pit the peaches. 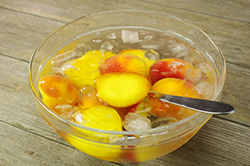 Place the peaches in a shallow bowl or baking dish. Using a potato masher, smash them into a pulp. 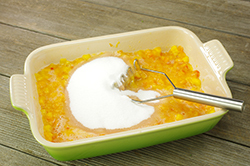 Stir in the sugar and let the fruit sit for a few minutes, until the sugar is mostly dissolved. 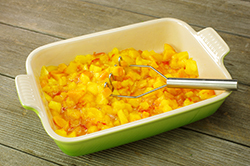 To cook, scrape the fruit into a large skillet, add the lemon juice, and place over medium-high heat. 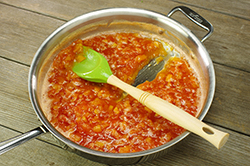 Stirring regularly, bring the fruit to a boil and cook until it bubbles and looks quite thick, 10 to 12 minutes. 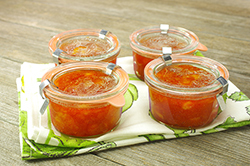 It’s done when you pull a spatula through the jam and it doesn’t immediately rush in to fill the space you’ve cleared. In the last couple of minutes of cooking, stir in the sriracha. 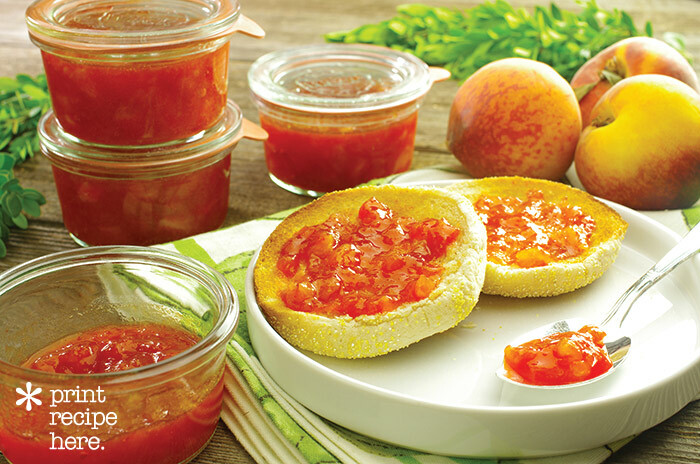 Remove the jam from the heat and funnel into the prepared jars, leaving 1/2-inch/12 mm of headspace. 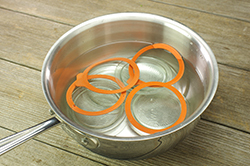 Wipe the rims, apply the lids and rings, and process in a boiling water bath for 10 minutes [see below].